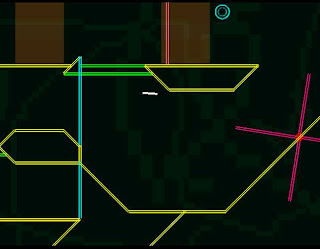 Flywrench is a distilled platformer that provides a rush of mechanically precise gaming from beginning to end. The music matches the minimalistic graphical style which in turn fits perfectly with the vague yet whimsically amusing story, if you can call it that. From the little information the text provided as it zipped along the screen and past my attention, I understand that something has gone terribly wrong with my computer system and now I have to take the helm and manually guide things back on track. You play as that little white line. Trust me, I thoroughly enjoyed Flywrench both times I beat it. The experience as a whole reminds me of Portal for a number of reasons, but more on that later. So far, I've given you my positive opinion of Flywrench. But, to understand exactly what this game is, I have to explain Flywrench's limitations first. To do so, I'll juxtapose Flywrench to Super Mario Brothers. While this may seem utterly unfair to some, let me assure you, indie/gamemaker/free game or not, if it's a game then it can be critiqued and measured against the greats. I called Flywrench a platformer because the player is focused entirely on moving through the environments with gravity as a constant factor. Where Mario uses the JUMP mechanic to leap off from the ground or other platforms, Flywrench uses the FLAP mechanic to gain altitude. However, because in Flywrench players can continually FLAP to stay afloat or ascend against gravity, the levels are designed around open space rather than solid ground. Where Super Mario Bros. employs a variety of different level elements, enemies, and secrets to develop its various JUMP platforming game ideas, Flywrench core design is composed almost entirely of enemy elements. An enemy element is any game element that can harm the player. In Flywrench, just about everything can potentially kill you (and by kill you I mean snap you in half like a pencil...literally). With practically nothing to comfortably rest against to gather one's composure virtually or in reality, the tension in Flywrench is automatically set to a high level. In other words, unless you fight and fight constantly, you will perish. The 2 level elements and numerous enemy elements in Flywrench cannot be transformed by the player using the primary functions or via any other mechanic. 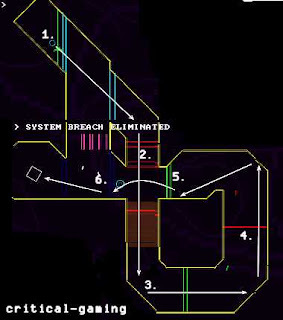 Aside from the blue circular "switches" that allow the player to pass through blue barriers, the levels churns on without player change. Likewise, there is hardly any interplay from the enemy elements. You're either alive, or dead. Able to move on, or broken into pieces. With such polarized player states, there's not much room for interplay. The two best examples of interplay in Flywrench are bouncing off of yellow surfaces while ROLLing and deflecting the green pea-like projectiles using the ROLL mechanic. Even in these examples, the interplay stops at step 1. In Flywrench, the player's control and movement speed are razor sharp. Because these controls naturally ramp the speed of the game so high, the game is highly stressed. Between the level visibility, scroll speed, and the player's speed of movement, playing Flywrench is like driving at high speeds at night with limited vision. In other words, very dangerous. Being able to see upcoming hazards and react accordingly is extremely difficult in Flywrench. To get through many levels, memorizing the sequences of hazards is an effective strategy. So what's left of Flyrench happens to be the best part of the game; the mechanics and the design decisions that were made to support them. As I've said, the controls in Flywrench are ultra responsive offering speedy razor like precision. Beyond input precision, the trio of primary mechanics are well balanced against each other to create a well rounded set of player abilities. The white lines represents the height gained from flapping in rapid succession the number of times displayed underneath each. FLAP, as the name suggests, folds the player avatar into a stubby red stick that can pass through red barriers. The animation/form looks like flapping wings, and the function matches. Along with the strong sense of gravity, Flywrench is designed with a strong sense of momentum. One FLAP won't get you very far. But two or three FLAPs in succession yields a rapid change in speed. 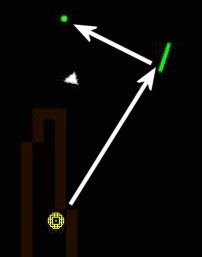 Players FLAP to gain altitude and FLAP to break from falling all according to the same additive momentum system. The amount of control the player has when flapping quantifies Flywrench's vertical platforming. In other words, the levels are successfully designed to limit the player where 1, 2, or 3+ successive FLAPs are the obvious levels of variation. MOVE. 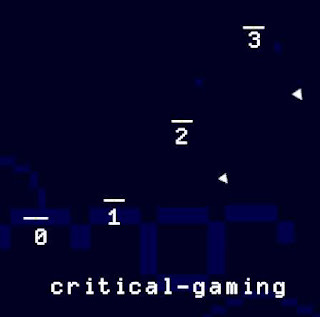 By hitting left or right, the player can travel horizontally at a brisk speed. The tilted form the white line takes on while moving helps communicate the function of horizontal movement. When holding the FLAP or ROLL functions, it is obvious that the red and green forms don't tilt. This effectively communicates that quick horizontal movement is only possible using the MOVE mechanic. ROLL. By holding the down direction, the player avatar turns green and rotates into a spin that can pass through green barriers and bounce off of yellow barriers. The form of a rotating stick matches the function of bouncing. The circular area that the rotating stick sweeps out is the other quantifying factor in Flywrench's level design. For example, passages that are blocked by green barriers can't be too narrow for the rotating animation to fit through. With the 3 primary mechanics, players can pass through 3 different colors of barriers and move in three unique ways (ie. FLAP for quantified vertical control, MOVE for smooth horizontal control, and ROLL/bounce for dynamic level dependent control). To focus the game on these tight mechanics, Messhof and his co-developers made several apt design decisions. Because the game moves so quickly and the player can die in the blink of an eye, Flywrench is designed to restart the level in the blink of an eye. This quick restart keeps the player synced into the fast pace of the game with zero time to mull over mistakes. Because of the simple straight forward design of the game, the player always knows it's their fault they died. Knowing this gives them more incentive to try again. In this way, the quick restart makes sure that Flywrench doesn't get in the players way. Though playing through a level successfully involve a bit of memorization, it is kept to a minimum due to the short bite sized levels. By the time the player memorizes the hazard for one section and moves past it, chances are the level is almost over. This keeps the player from being bogged down when they're unable to keep everything straight in their head. Each of Flywrench's 9 planets contains only a few levels. Some planets have upwards of 8 levels while others have around 3. The part that I appreciate most about the planets is that each one is designed with a particular focus or theme based around a different mechanic or group of mechanics. Each theme is fleshed out through levels that are designed to teach the player the intricacies of the primary mechanics. Pluto, the first planet, is all about understanding gravity, horizontal movement, and vertical movement when in either the MOVE or FLAP state. Neptune is all about the ROLL mechanic. The next planets focus on pink moving barriers, then blue switch barriers, then heavy brown gravity and beyond. Let's look at Pluto's level design and idea development using translation. Translation is simply the rewording or paraphrasing of a game idea into another medium (typically words). Gravity makes you fall whether you like it or not. White passes through white! The MOVE mechanic moves you. Good thing you're already white. Gravity makes you fall, remember? Even if you FLAP and hold, you'll eventually fall. You can't just MOVE through this one. Gather some momentum and FLAP-hold to slip through. You can gather momentum vertically too. Let's see if you can put together the concepts from 2. 3. and 5. Oh, and there's less room now. Can't you do it reversed? This level uses concepts from 1. 4. and 5. Same concepts, but a little tricker. Timing is key. Clearly the concepts or game ideas behind levels 1-5 are the core mechanical concepts for the FLAP and MOVE mechanics. 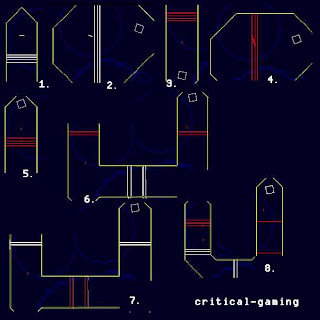 Developing these concepts by designing a focused level for each is a highly effective way to guide the player into learning the intricacies of the core mechanics of Flywrench. 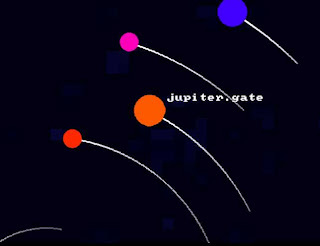 Pluto contains the most levels of any planet in the entire game. Taking the time to slowly build this foundation is what helps make Flywrench a tight and entertaining experience from beginning to end. With the addition of new each new mechanic, Messhof only designed as many levels featuring the mechanic as needed to communicate how the new mechanic changes the existing strategies. 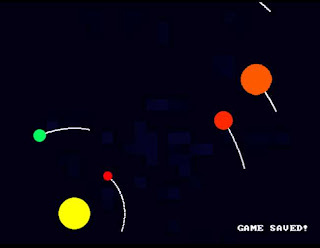 Once this was accomplished, the levels end and the player moves on to the next planet. By not simply filling up the game with levels that reuse previously experienced concepts, Flywrench feels fresh and concentrated. In all, it took me 23 minutes to beat the game on my first try. Like Portal, the quirky story elements and player mechanics really come together succinctly by the end with a final level that puts the strawberry on the cake so to speak. Though the core design is extremely limited, Flywrench intelligently focused on what it does best and made the most of the rest. The levels are unique, creative, and most importantly appropriately difficult. Because all the levels are pretty short, even the most difficult sections are manageable. Infinite lives takes the edge off of survival and keeps things focused on playing and getting through this short but memorable game. At its best, Flywrench has an exhilaration and flow that is very reminiscent of Super Mario Bros. 3. This is one of the highest compliments possible for a 2d platformer. If you don't believe me, then you should play the game for yourself. While you're at it, be sure to pay attention to this level. It's my favorite in the whole game. The non-stop flow follows the numbered path I outlined transferring falling to bouncing to rising preserving momentum all the way through. Due to Flywrench's tight concentrated nature, there simply isn't much to repair. Fixing the camera issues would involve changing the game at the core level, which would result in a cascading effect on the rest of the game design. In the end, going down that path wouldn't be so much of a repair as creating a sister game/sequel. There are some story/text glitches that should be addressed. The hitbox for the blue circular switches could be a lot bigger. I don't know how many times I thought I hit the switch only to fly to my death. After beating the game (or maybe even at any time) I would like to be able to select levels to play again. When I beat the game, I experienced an error that froze everything up. Toward the end of the game, the music was dark and nearly drove me crazy as I tackled the more difficult levels. I turned off the sound at that point. The music should never drive the player to play without sound.